Some good friends of mine are getting married and I couldn’t be happier for them. I am trying to start a tradition where I make a nice wedding present for friends that get married. A majority of my friends are already married, but better to start late than never! I asked them what they wanted and got 3 answers: A table to put keys and stuff on near their front door, a shoe rack, or a wine rack. I chose to combine the first two and drop the 3rd. My initial plan was done in sketch-up. Other than a shortening of the legs due to an unfortunate accident I went with all my original dimensions. I don’t model every mortise and round over in sketch-up, instead using it as a way to get the general look and feel of the project and to get a rough cut list. A trip to the local cabinet store turned up some nice looking red oak, but only 4/4 thick. It was enough to get started with, but I eventually had to go to Orlando to get the 8/4 (thats 2 inches). Luckily it was combined with a trip to do a suit fitting for said couple’s wedding! I cut everything out and ripped it to rough width using my table and chop saw. 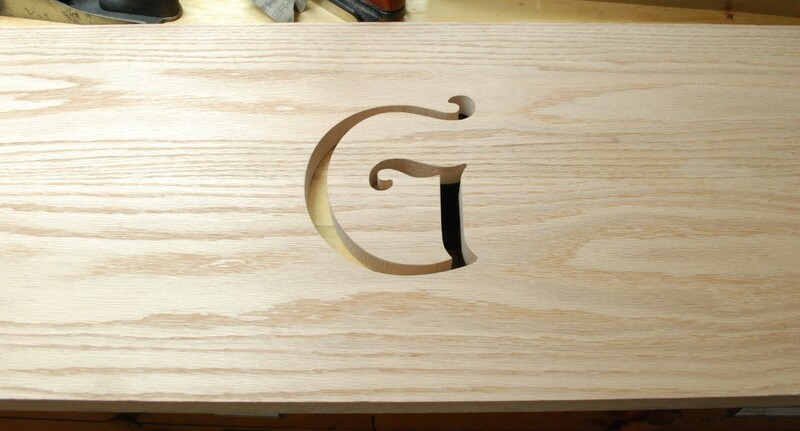 Other than a router for the top edging, and a CNC mill for the “G” everything was done by hand. I started this project in early January and managed to lose a number of pictures in that time. I am missing quite a bit of my mortise and tenon work and the beading process. Still, there are enough pictures to get the idea of how it all went together. I was quite proud of the bead along the bottom apron edges. It was done with a beading iron in my No 45 combo plane. Planing off the bottom flat bit makes it look better. One shot has two beads, one before and one after planing off the flat. I am missing a lot of the photos of cutting the mortises, but I made a lot of mistakes and they are rather rough. I used a rabbet plane and cleaned them up from the picture, but they still weren’t great. 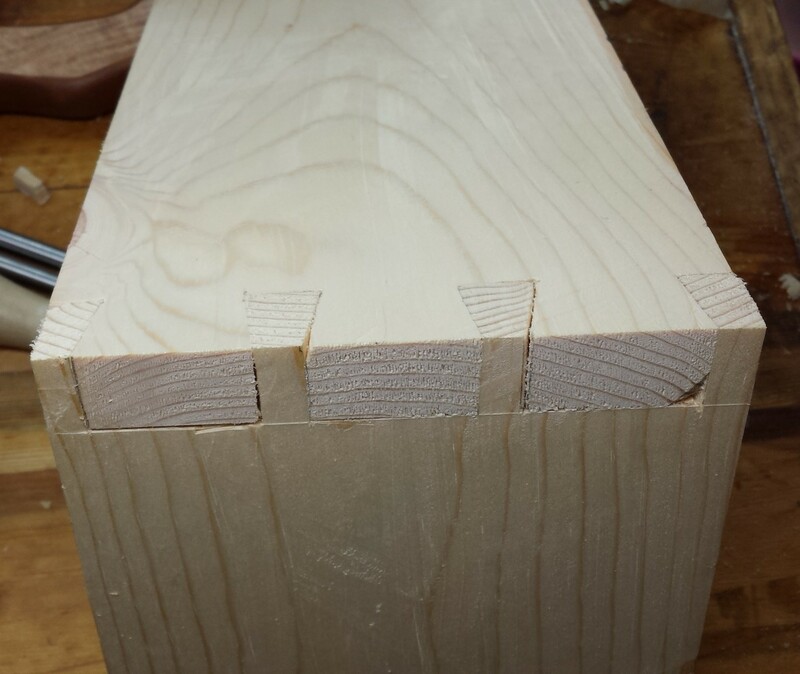 My little rip dovetail saw wasn’t quite up to the task of cutting those cheeks. Hopefully a full tenon saw is in my future. I squared the legs up well enough that they could be mortised. I initially tried using pencil mark my parts to keep the organized, but ran across a really good idea by John over at Woodworks by John. Mark the joining parts with letter stamps. After much trimming and swearing the table stands! 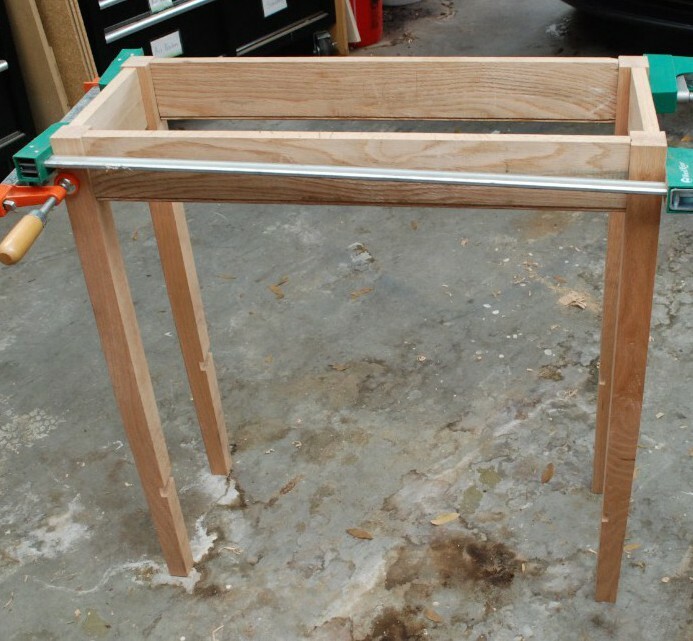 I had already cut out the legs and squared them to do the mortises. Next I cut them to length and did a taper on the outer two surfaces. It starts about 24″ up and drops down to make the bottom of the foot about 1″ square. Tapering is a lot of work! 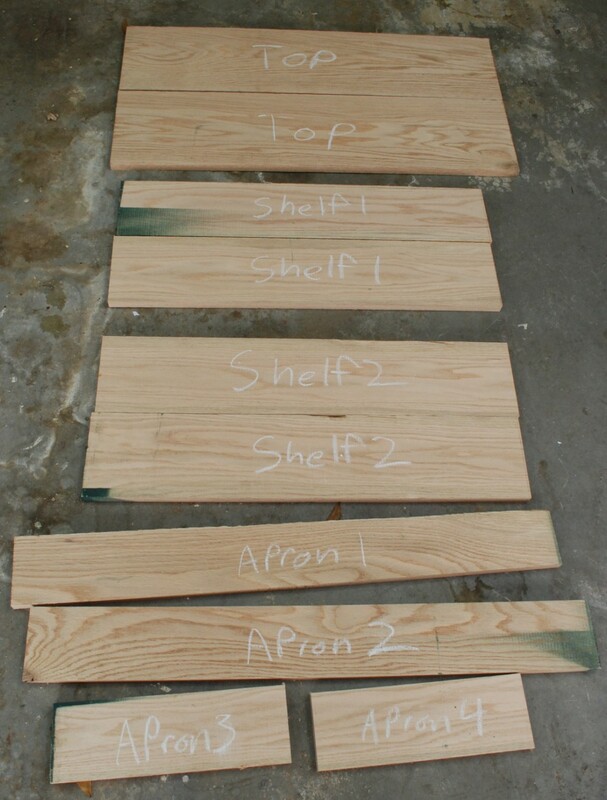 Once I got the tapering complete I was able to cut the grooves for the bottom shelves. I assembled each side with apron and laid out each cut with a long ruler so I could get both legs. 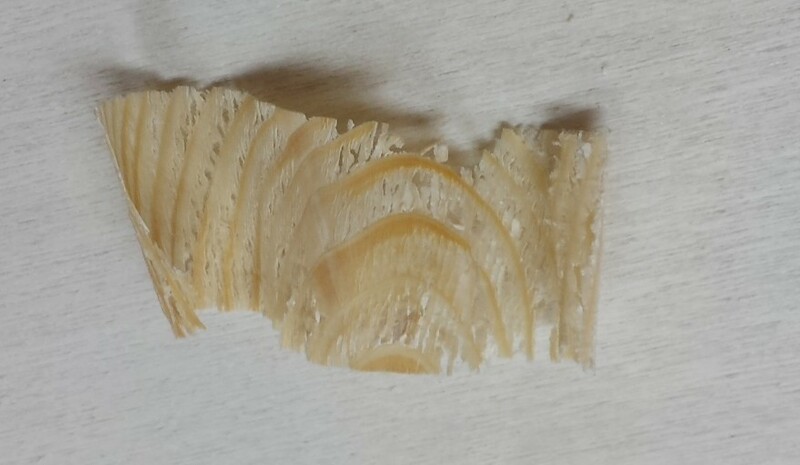 The sides were cut down with a saw, then removed most of the waste with a chisel. The final depth was handled with a router plane. What a great looking job, I did something like this over a year ago before I had a router and this turned out 10 times better! Next time I will taper last. Everything had to be shimmed up to hold still because of the leg taper. This is where a huge issue came in. I cut the left side and it turned out pretty well. Next I moved on to the right half and cut the left half again. Lighting makes the grooves a bit hard to see. Two left sides… crap. I set down my tools and went inside to do something else. I had invested hours into each leg. I was able to turn lemons into lemonade though. The table was set to be just over 40″ tall, which after assembling feels too tall. Two sets of shoe shelves would be useful, but looked a bit more cluttered than one. 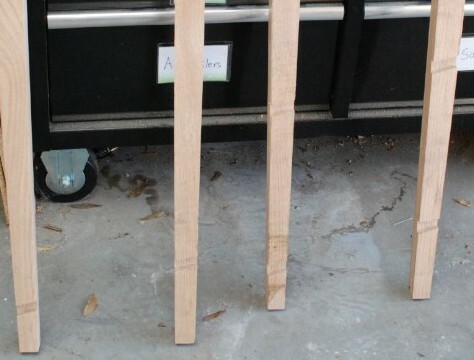 I decided to cut the bottom set of shelf grooves off, and re-taper the legs. Work work. Here is the new shortened version along with one of a few piles I had to sweep up while making this thing. 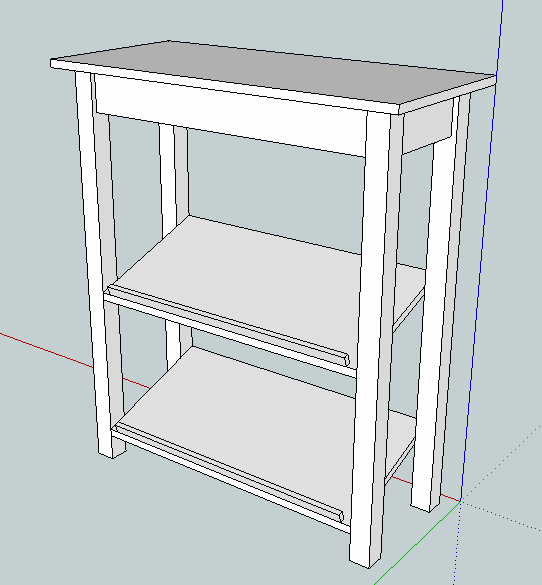 I assembled the bottom shelf along with the top in a similar manor. I really wanted to bring in some decorative accents here. Carving is out of my skill set, but the mill can do wonders. How about a nice scripty G in the center of the shelf? Done! Their last name starts with G.
With all the parts cutout and shaped properly I went about finish planing every surface smooth and clean. Some of the oak got squrley and left me with tear out. I don’t have a high angle plane, and I am crap with a cabinet scraper so they will have to remain as a finishing “feature”. To keep the top on I am using small clips that fit into slots on the apron and screw into the top. They will allow the large top to have moisture movement without trying to pull the base apart. There are a lot of surfaces that needed gluing and seconds matter when glue is drying. I did a number of test fits and got all my clamps at the ready. The glue up went smoothly! 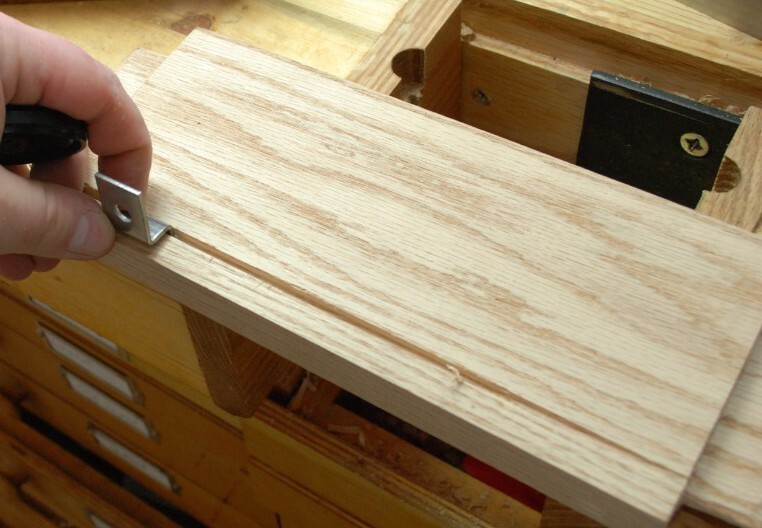 A short rounded over piece glued to the bottom shelf will keep shoes from sliding off. The bottom shelf sits in a groove. The weight will be held well by the groove, but few glue surfaces means it could break free. 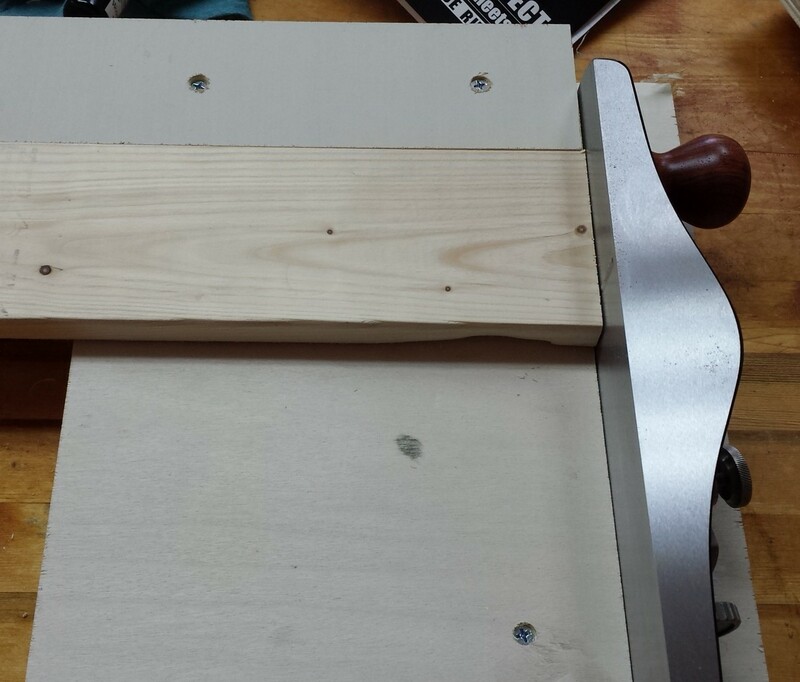 I went ahead and drilled out the legs/shelf and glued a 3/8″ dowel in to help improve the hold. A small block plane got the dowels down as smooth as a baby’s bottom! A dark finish was requested and I have had some great results with minwax’s stain on oak. I think the grain pops really well, and I had a lot of the stain around. Once completely dry I sprayed the top and base with multiple coats of general finish’s high performance water based coating. What a great product. That stuff goes on like silk and dries smooth. Spraying can be a pain, but the results are worth it. Over all, there were mistakes made, lessons learned, and a lot of sweat. I was able to finish a few days before the wedding and delivered it to the happy couple. May the table last for a century, and may your love last longer. Did I mention it comes with a lifetime repair warrantee? For further adventures in hand cut woodworking I will need a shooting board. If you don’t know what one is, the use will become clear soon. After my miter box debacle I should have gone simple for a shooting board. I didn’t. My first attempt had an adjustable and removable stop cleat on top with hand cut grooves and yada yada. It didn’t work well. I backed up and thought simple and short term. A shooting board lets you place a low angle jack plane (good for cutting end grain) on its side while holding a board to be trimmed square against a backer fence. The plane runs across the end grain taking tiny shavings as it goes. 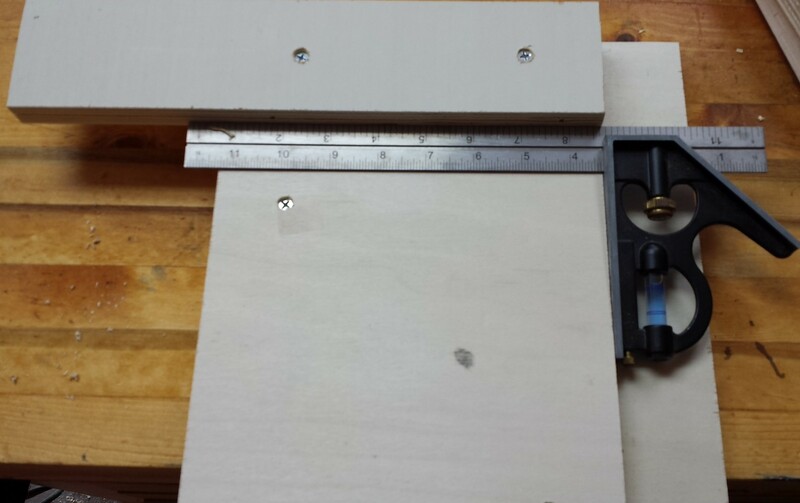 I attached two pieces of 3/4″ plywood to each other allowing a two inch strip on the right for the plane. Then, at a 90 degree angle to the plane running slot I attached a stop fence. Here it is with a scrap pine board being trimmed. The plane is my new No 62 woodriver low angle plane. 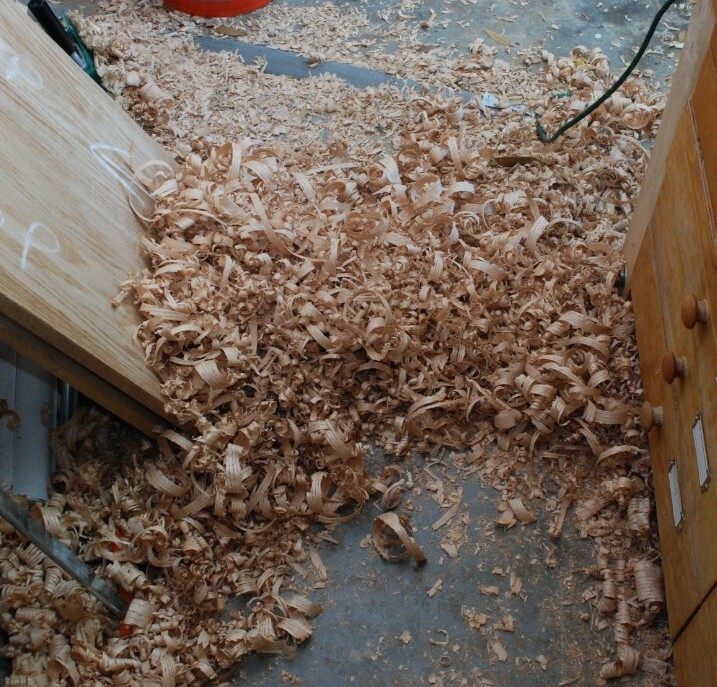 As you push the plane forward, it cuts off tiny shavings from the end grain. If the original cut wasnt perfectly square, the shooting board should fix it. Also, It makes the end grain finish look much nicer than any saw could. 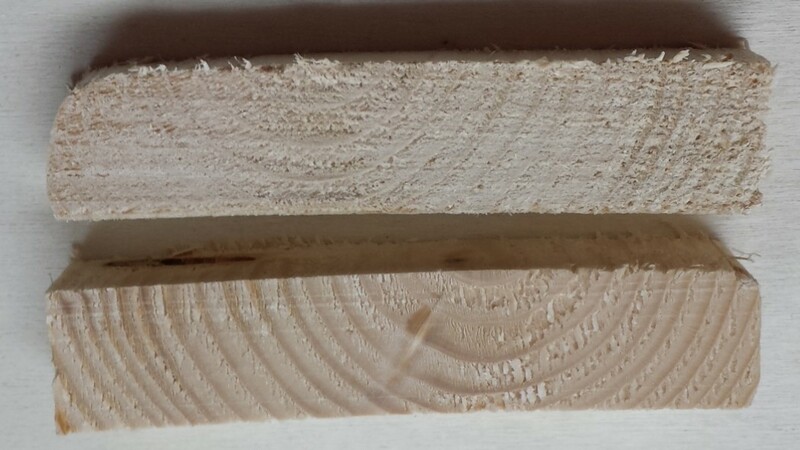 The top piece of pine was saw cut, the bottom was cleaned up with the shooting board. I will have to monitor the squareness of the fence. If it wonders over time, that will introduce errors into my work. Until then, this one works well. So well, I had enough time to start some dovetail practice parts. TADA! My first hand cut dovetail. I needs some cosmetic help, but holds well and is a really sturdy joint. I will post more details once I have been through a pile of them and have a more solid procedure. The shooting board did a good job of squaring up the pine and giving me a workable surface. Next, dovetail joined crates to store half pint jars. Practice makes perfect.